THROUGHOUT THE UNITED STATES THERE ARE NUMEROUS places where a particular ethnic group has long been identified with an area, and names such as “Little Italy,” “Germantown,” “Chinatown,” etc. have become a part of the local fabric. I decided to embark upon a search for a place in the United States that might be considered “Little Lithuania.” In comparison to some other ethnic groups, Lithuanian Americans are a small group (officially about 715,000) with little public national recognition, so a well-known “Little Lithuania” did not immediately come to mind. There were several ways to approach the search, which included: locate the city or area with the greatest number of persons of Lithuanian ancestry, look for a neighborhood in a large city with many persons of Lithuanian ancestry, or locate the area where persons of Lithuanian ancestry make up the greatest percentage of the local population. I decided to utilize the last approach; in part reasoning that the percentage method was fairly objective, and that it would lead me to the area where Lithuanians would have the greatest historic and current impact in the local community. I employed the U. S. Census Bureau’s website since it provides online maps by state, county, congressional district, and three digit zip codes of the concentration of various ethnic groups based on the 2000 census. I elected to use the county map function. I discovered that the county with the greatest percentage of persons of Lithuanian ancestry was Schuylkill County, Pennsylvania with 5.9% of the population being Lithuanian. Upon further investigation I learned that Lithuanian Americans made up more than 10% of the populace of twelve Schuylkill County communities, and that in one of these communities one out of four persons was of Lithuanian ancestry. (Actual percentages are as follows: Blythe Township – 12.1%, Frackville Borough – 11.2%, Gilberton Borough – 12.9%, Girardville Borough – 16.5%, Mahanoy City – 15.2%, Middleport – 14.5%, New Philadelphia – 25.8%, Norwegian Township – 13.5%, Ringtown Borough – 10.3%, Ryan Township – 13.2%, Shenandoah Borough – 14.3% and Union Township – 12.2%.) Schuylkill County has a modest population of about 150,000 with about 9,000 persons of Lithuanian ancestry. In contrast, Cook County, Illinois (Chicago area) reports nearly five times more persons of Lithuanian ancestry (44,066). However, these Cook County Lithuanians make up less than 1% (.8%) of Cook County’s population. The Schuylkill County numbers objectively suggested to me that there might be both a potential historic and current impact by Lithuanians within the county. Schuylkill County is located in Eastern Pennsylvania south of the Pocono Mountains about midway between Wilkes-Barre, PA and Reading, PA, and its location on the map does not readily suggest a reason for the development of a thriving Lithuanian community within its boundaries. The next step was to review my collection of Lithuanian American history books, which included discussions of the development of the Lithuanian community in America. The obvious answer was “COAL” since Schuylkill County was Coal Country. 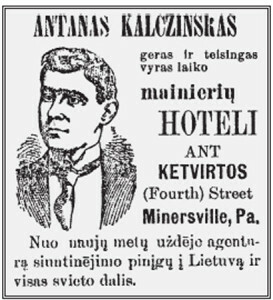 A hundred years ago, Schuylkill County was certainly a hub of Lithuanian activity, and many of its communities would probably qualify as a “Little Lithuania.” In 1904, a person could probably walk down the streets of Shenandoah, go to St. George for confession, visit the local butcher and vegetable vendor, or make a stop at a local saloon for some alus (or attend a meeting of the St. Joseph’s Temperance Society) while using the Lithuanian language as the only means of oral communication. 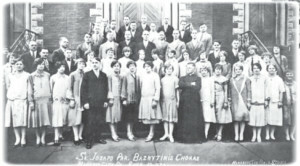 However, while the current Schuylkill County census numbers suggested that the vestiges of this once thriving Lithuanian community remain, the question is, “Does the Lithuanian ethnic spirit in fact still exist at the beginning of the 21st century?” It became apparent that a “road trip” to Schuylkill County was in order. While I thought about taking the two-hour plus trip from my home in New Jersey to Schuylkill County and just roam around looking for Lithuanian sites, I reconsidered and concluded that it would be best if I contacted a “local” Lithuanian to assist me in my ethnic journey. I conducted an Internet search and found that Council 144 of the Knights of Lithuania was located in Schuylkill County, and that it had a website. I e-mailed the Council’s contact person, Bernice Mikatavage, and I advised her that I was a member of the K of L Council in Philadelphia while explaining my mission. Bernice responded and offered to be my tour guide, but she suggested that I postpone my trip until late spring (weather-wise, the Northeast in 2003 had a truly horrible winter and early spring.) In the interim, Bernice and I regularly exchanged e-mails, and she provided me with much background information. Finally on a dreary and rainy day in early June, I was off to Schuylkill County. Even in the rain, Schuylkill County is beautiful. There are trees everywhere, and it reminded me of some of the rural areas of Lithuania that I had previously visited (albeit without the Pennsylvania hills and mountains.) In the morning I arrived at Bernice’s home in Minersville, and after an initial greeting, she proudly pointed out her rūta plant in her garden and offered that there were many other such plants in gardens throughout the county. Bernice is a native of Schuylkill County, and all her grandparents immigrated to the area from Lithuania. She had arranged a Schuylkill County “Lithuanian heritage day” tour for me. Bernice provided me with some background information about the current residents. The Lithuanians in the county are mainly the descendants of the first wave of immigrants. The DP generation and recent Lithuanian immigrants generally did not settle in Schuylkill County because of the lack of economic opportunities. With the end of WWII, the demise of the coal industry occurred throughout much of Northeast Pennsylvania, including Schuylkill County. The result was a net population loss. For example, in 1980 Schuylkill County had over 160,000 residents, but twenty years later the county population was a little over 150,000. The population loss has also impacted the Lithuanian community. In 1990, persons of Lithuanian ancestry were 7.4% of the county’s population, but in 2000 the percentage had dropped to 5.9%. Our first visit was to Bernice’s neighbor, Annie Morgalis. After introductions, Annie asked me if I was Lithuanian. I explained that all my grandparents had emigrated from Lithuania to Luzerne County, PA (the Pittston area), and that my surname should be “Černiauskas.” After that explanation, Annie’s smile grew broader. Lithuanians are well known for their love of nature and this love was obvious in Annie. 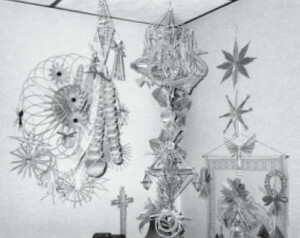 Annie’s home was decorated with a variety of margučiai (eggshell) and šiaudinukai (straw) art. She advised me that her mother had taught her the basics and her creative spirit has inspired her work throughout her life. Our next stop was to St. Francis of Assisi Church, a Lithuanian Catholic church founded in 1895. The parish school was established in 1925, and it is now the home of Good Shepherd Regional Catholic School. From its inception, the parish school has been staffed by the Sisters of St. Casimir, a religious order founded by Mother Maria Kaupas to educate young Lithuanian Americans, and whose first convent was located in nearby Mount Carmel. Sadly the sisters’ long tenure at the school ended with the close of the 2003 school year. While on the topic of churches, I have discovered that when one travels the American countryside, one can tell much about the historic and current ethnic mix of a particular area by the nature of the houses of worship you encounter. I grew up in the middle of the farmlands of Southwest Ohio (Xenia, near Dayton). In the Xenia area there are numerous Methodist, Baptist, and other Protestant churches, with a single Catholic church found among the mix. Indeed, Methodists and other Protestant groups originally settled the Xenia area. However, as a child when I journeyed with my parents to the Pittston area for summer vacations, I was amazed that there were Catholic churches everywhere. On Sundays we would pass several Catholic churches on our way to St. Casimir’s Lithuanian Catholic church, so my grandmother could hear the gospel and sermon in Lithuanian (those were pre-Vatican II days.) Schuylkill County’s diversity of its houses of worship is revealing. In the rural area of the county, I encountered an assortment of Protestant churches. However, while driving through various towns to visit some of the county’s Lithuanian Catholic churches, I saw a variety of other Churches—Russian Orthodox, Ukrainian Orthodox, Ukrainian Greek Catholic (Eastern Rite), Ruthenian Catholic (Eastern Rite), a myriad of Roman Catholic churches, and an occasional Protestant church. This sampling suggested to me that there is a very rich and diverse ethnic mix in the county, and that immigrants from a variety of countries played a role in the development of the county. Today their descendants remain as active participants in the community. In Schuylkill County there are several active Catholic parishes designated as Lithuanian churches. These are: Annunciation B.V.M – Frackville, St. Vincent De Paul – Girardville, St. Joseph – Mahanoy City, Our Lady of Šiluva – Maizeville, St. Francis of Assisi – Minersville; Sacred Heart – New Philadelphia; St. Casimir – Saint Clair; St. George – Shenandoah; and SS Peter & Paul – Tamaqua. Nine Roman Catholic churches to serve the religious needs of the county’s Lithuanians is an impressive number! Often within an ethnic Catholic Church, one’s ethnicity is recognized, maintained, and nurtured. I did not visit all these Lithuanian Catholic churches, however, I certainly came away with the feeling that these churches kept the Lithuanian spirit alive and burning. While visiting St. Joseph Church in Mahanoy City, we first encountered two ladies hauling some foodstuffs into the basement of the church. I offered my assistance, and I carried a bag of red beets into the basement. The church was preparing to participate in the Mahanoy City ethnic celebration during the upcoming weekend. I surmised that a Lithuanian beet soup was on the weekend menu. The church is 115 years old and beautifully maintained. It is the home of a very active Lithuanian youth group, the Junior Knights of Lithuania of Council 144. St. Joseph is also religiously significant as it maintains the Perpetual Adoration of the Blessed Sacrament 24 hours a day, seven days a week. While St. Joseph is probably not unique, I could not recall another church that provided this devotional opportunity to the faithful. Our Lady of Šiluva in Maizeville was a very interesting stop on our “Lithuanian heritage tour.” It is the only church in the United States that bears the name of “Our Lady of Šiluva.” Inside the church on the ceiling above the altar is a beautiful etching in plaster of the apparition of Our Lady. Our tour guides of Our Lady of Šiluva were Al and Ann Yachachonis. Al is a retired coal miner, and he shared with me some memories of his coal mining days. He recalled having to routinely climb up a 30 foot ladder in the mines to even reach the coal, and that the actual mining work was very labor intensive. It was coal that first attracted Lithuanians to Schuylkill County and Al’s experiences were undoubtedly similar to the original Lithuanian miners and their coal miner descendants. Perhaps the “crown jewel” of the Schuylkill County Lithuanian Catholic churches is St. George in Shenandoah. This beautiful Gothic church, with its original altars decorated in gold and white, contains the statutes of the Twelve Apostles in the lower portion of the main altar with statutes of St. George and other saints above the apostles. Fifteen murals on the ceiling above the main aisle depict the Mysteries of the Rosary, and their titles and those of the Stations of the Cross are written in Lithuanian. If I did not know my current location in space, St. George could have easily been in Kaunas or any other Lithuanian city. Another keeper of the flame of the Lithuanian identity within Schuylkill County is Council 144 of the Knights of Lithuania. The Council numbers about 200 members, and it maintains an active Lithuanian museum and cultural center in Frackville. The museum’s collection includes a variety of Lithuanian immigrant artifacts, art, handicrafts, memorabilia, and a library of books in the Lithuanian language. K of L Council 144 also sponsors the annual Schuylkill County Lithuanian Days held in August and currently held at the Schuylkill Mall. This festival has its origins nearly ninety years ago when the local Lithuanian community came together in celebration during the Feast of the Assumption, a major Lithuanian religious holiday. The festival has continued over the years as an annual celebration of Lithuanian ethnic pride with food, music, dancing, and cultural displays, which draws Lithuanian Americans from throughout the local area and from afar. A mutual Lithuanian American friend of Bernice and me, Vince Kreder, who now lives in Druskininkai, Lithuania, has his American roots in Schuylkill County. While Vince grew up in New Jersey, he reported that Lithuanian Days was the event of the year. Vince advised me that in his younger days he would travel to Schuylkill County a day before the celebration and share a keg of alus with his uncles to prepare for the upcoming festivities. Besides sponsoring Lithuanian Days, K of L Council 144 also provides direct assistance to Lithuania. Bernice’s principal council activity is to organize and implement the council’s collection and shipment of clothing and other items to the needy in Lithuania. This ongoing activity is housed in a two-story building across the street from Bernice’s home and the council annually ships about 7,000 pounds of clothing and other necessities to the needy in Lithuania. Minersville, and my expert guide and companion on our “Lithuanian heritage tour.” She is standing outside the Knights of Lithuania Museum in Frackville. During my tour I was hoping to view some visible indications of the current Lithuanian impact upon the business community (e.g. a sign with “Černiauskas & Grigaliūnas, Attorneys-at-Law.”) Except for the occasional funeral director’s sign, I did not encounter any obvious Lithuanian business signage. Bernice told me that there were numerous businesses in the county operated by Lithuanian Americans, but that their surnames had often been Americanized with the result that any remnants of the original Lithuanian surname had been lost. However, despite the apparent visible loss of a Lithuanian ethnic identity in the business community, the ethnicity of the shopkeeper often remains known to the locals. For example, in New Philadelphia, where the major ethnic groups in the community are Lithuanian and Irish, there are two small grocery stores – Mullen and Snyder. However, everyone knows that a Lithuanian family operates Snyder. Further, Yorke’s Market in Tamaqua is operated by a Lithuanian family and is known for its Lithuanian sausage. “Geo. G. Garmus… Feb. 3, 1925, repaired bursted water pipe.” Paul explained that in those days tradesmen often provided a receipt of their work by actually writing it on a part of the building structure near where the work was completed. After the tour, while we were on the sidewalk in front of the store, a passerby apparently noticed my “Lietuva” baseball cap, a gift from the Kaunas baseball coach, and joined our conversation by proudly announcing that he was half Lithuanian! Our next scheduled designation was to several Lithuanian cemeteries in Shenandoah Heights. However, we first enlisted the assistance of a Lithuanian couple from Shenandoah, John and Mary Koons, who were very familiar with the area. After an initial introduction, Mary asked me if I was Lithuanian, and I repeated the explanation of my Lithuanian ancestry and surname. Mary’s smile grew broader, and I offered a greeting in my very limited Lithuanian. Mary responded with a pepper of Lithuanian phrases that were unfortunately beyond my comprehension level. After this friendly exchange, we first journeyed to St. George’s old cemetery. Buried and prominently remembered in St. George is Father Andrius Strupinskas, the first Lithuanian priest in the United States. 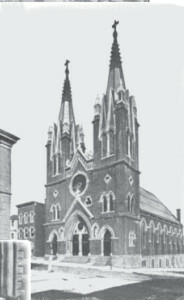 Father Strupinskas was a Marian priest who established in 1872 the first Lithuanian parish in the United States, St. Casimir in Shenandoah. St. Casimir was later ceded to the Poles in 1877. As our tour of St. George unfolded, Mary pointed out that the cemetery next door was a Jewish cemetery. 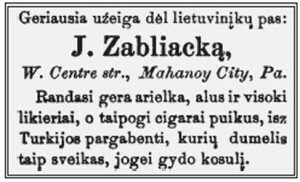 Mary advised that many Lithuanian Jews came to Schuylkill County and that they played a prominent role in the economic development of the Lithuanian community. Reflecting upon our visits to several Lithuanian cemeteries, I have some observations. 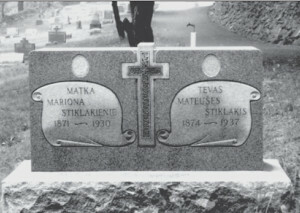 The cemeteries were very well maintained, there were numerous older gravestones of substance, and many of them contained “Tėvas” (Father), “Motina” (Mother) and Lithuanian phrases to remember the decedents. Further, several gravesites had a fresh Lithuanian flag displayed. As an area’s demographics change, families move away, and churches close, you are likely to encounter derelict or abandoned cemeteries. This certainly was not the case during my visit and demonstrated to me the existence of a steadfast Lithuanian community dedicated to preserving the memories of their loved ones and also maintaining their ethnic pride. While time and wet driving conditions did not permit a visit to a particular unique Lithuanian cemetery, Bernice provided me with some background about the local “Liberty” cemetery. During the pre-WWI effort to reawaken a national identity among Lithuanians, there developed two principle factions. One was religious in nature and believed that this reawakening could best be achieved through the Lithuanian Roman Catholic churches. The other faction lead by Dr. Jonas Šliūpas believed that the reawakening could best be achieved through secular means. The competing factions resulted in some conflicts and the followers of Dr. Šliūpas’ faction (the Šliūptarniai) were often labeled as liberal “free thinkers.” Either denied burial in a Catholic cemetery or by a decision made by the decedent’s family, these local “free thinkers” found a final resting place in the Lithuanian Liberty (a.k.a. as “Šliūputė”) Cemetery located in Shenandoah Heights. Another indicator of the health of a local ethnic community is its impact upon the greater community. Schuylkill County Lithuanians currently play important roles in local government. David Dutcavich is the mayor of Minersville; Ronald Shatus, Albert Kuklis, and John Klazas are members of the New Philadelphia Borough Council, and Frances Tkach is the Borough mayor; Frank Tamulonis is Solicitor of Middleport Borough; and John Domalakes is a Judge of the Schuylkill County Court of Common Pleas. The influence of the Schuylkill County Lithuanians goes beyond the county boundaries. From 1965 to 1975, Joe Balsis of Minersville was regarded as one of the best billiard players in the world. Joseph Vadus of Minersville is a highly regarded oceanographer with a national reputation. The county and the Lithuanian community take great pride in the accomplishments of Rear Admiral Nancy Lescavage, a native of Port Carbon and the current Director of the Navy Nurse Corps. Admiral Lescavage’s mother is Lithuanian and the Admiral readily acknowledges her Lithuanian ancestry. Further, Admiral Lescavage has not forgotten her Schuylkill County roots, as she was the June 2003 Commencement speaker at Nativity High School, Pottsville. We did not encounter a Lithuanian deli or restaurant. However, we did visit the renowned Kielbasa shop in Shenandoah where a person can purchase fresh sausage to suit any particular ethnic taste. We ended our long day at a local Italian restaurant where we enjoyed dinner. After dinner I said goodbye to Bernice and thanked her for her time and expert guidance in helping me find and understand the Lithuanian community of Schuylkill County. I filled my SUV with gas, purchased a local newspaper, and began my two-hour plus journey back to my home in Ewing, New Jersey. On the road to Ewing, I reflected upon my visit. I was a bit disappointed that the strong Lithuanian heritage of the county was not initially obvious to the outsider. I suppose I was expecting to see “Lithuanian spoken here” signs, a grand Lithuanian Music Hall with the Lithuanian flag proudly flying in the breeze, or folks walking around with “Kiss me, I am Lithuanian” buttons. 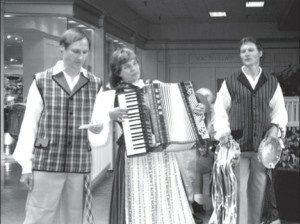 The Schuylkill County Lithuanian Days, sponsored by Knights of Lithuania Council 144, is held every year at the Schuylkill Mall. It features Lithuanian food, handicrafts, and lively music. When I returned home, I began reading the Schuylkill County newspaper, the Pottsville Republican & Evening Herald, which I had purchased earlier in the day. Vincent Yurkonis died on Monday; Mary Bakas celebrated her 90th birthday; 5th grader Aaron Mickonis attended a Red Cross blood drive assembly at his school; John Balulis joined other members of the Seltzer Hose Company for the dedication ceremony of the Company’s new fire truck; and Amanda Kuperavage had two hits and scored two runs for Nativity High School in its victory in the opening round of the girls’ softball fast-pitch State Class A tournament. Yes, the Lithuanian community in Schuylkill County remains alive and active. 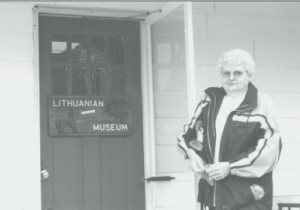 They are the descendants of the first wave of Lithuanian immigrants to the county; they are members of an energetic local Knights of Lithuania Council; they attend meetings of the county’s Lithuanian Women’s Club, which has been in existence for nearly seventy years; they worship in a variety of Lithuanian Roman Catholic churches throughout the county; they maintain resplendent cemeteries that bear the remains of their forbearers; they attend and work at the annual Lithuanian Days’ celebrations; they are active participants in the local community; they are contributors to the betterment of their community; and they are proud of their Lithuanian heritage. Grave-marker at the old St. George Cemetery in Shenandoah. We can understand “Tėvas” (Father), but “Matka”? You have to scratch the surface a little, but you will find a thriving Lithuanian community in Schuylkill County that is mindful, respectful, and proud of its ethnic heritage and strives to keep the Lithuanian spirit alive and burning for future generations. Yes, Schuylkill County may certainly be considered Lithuania-U.S.A. You just have to scout around a bit.